Hair-Thickening Shampoo: How Often Should You Use It? It’s time to re-think the way you do a daily, essential task, something that is so much a part of your routine that you probably don’t put too much thought into it: washing your hair. If you’re interested in having thicker, fuller, hair with better volume and easier control, then you might consider upgrading to hair-thickening shampoo, which is designed to improve your hair from root to tip. But how how often should you use thickening shampoo? What about the conditioner? Even the best thickening shampoo can’t stand on its own, especially if you suffer from dry hair or a dry scalp. 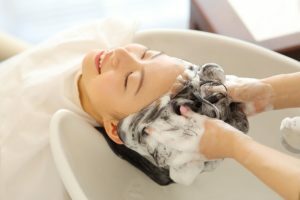 Here are the recommendations by hair care experts about how and how often to wash your hair to get the best results, especially if you want thicker, more youthful looking hair. Most men tend to wash their hair every single day, and if they happen to work some gym time into their daily routine, they may even wash twice. But is this the best thing for your hair? Actually, it isn’t. Many stylists have found that over washing can lead to dry, brittle hair. This type of hair may actually be more likely to fall out. But what if you have an oily scalp? Should you wash every single day? For some people, washing less often, such as three times a week, can make your hair less oily. Stylists have seen hair balance out because the body starts releasing less oil into the scalp and hair if you wash it less. While there isn’t scientific evidence to support this, there is anecdotal evidence from hair care experts. But you may be asking, “What if I end up with sweaty, oily, and foul-smelling hair?” Shampoo does make your smell better and does clean it of dirt, sweat, and oil. But it’s not the only method. The best hair-thickening shampoo will offer the most benefits to your hair if you only use it a few times a week. Every other day is best, or every third day if you suffer from a dry scalp or brittle hair. While you should continue to shower daily, you can treat your hair differently. For instance, you could try conditioning daily, and only using shampoo on other scheduled days. Conditioner will improve the smell and feel of your hair without drying it out. In fact, it can help restore the moisture in your hair. Companies that sell hair thickening shampoo for men can also sell conditioners that are safe for daily use. You’ll get the benefits of thicker, fuller hair, and even formulas that contribute to new hair growth, without drying out your hair. So, it may be time to reset a routine that you’ve been doing your entire life: washing your hair. Adjust your routine for better-looking hair that’s easier to style. You may also want to consider upgrading your plain, generic shampoo for hair-thickening shampoo from Hair ResQ. Visit Hair ResQ’s online store so that you have an ample supply of not just shampoo for occasional use, but conditioner for daily use. Start shopping today and you’ll see the quality of your hair transform.